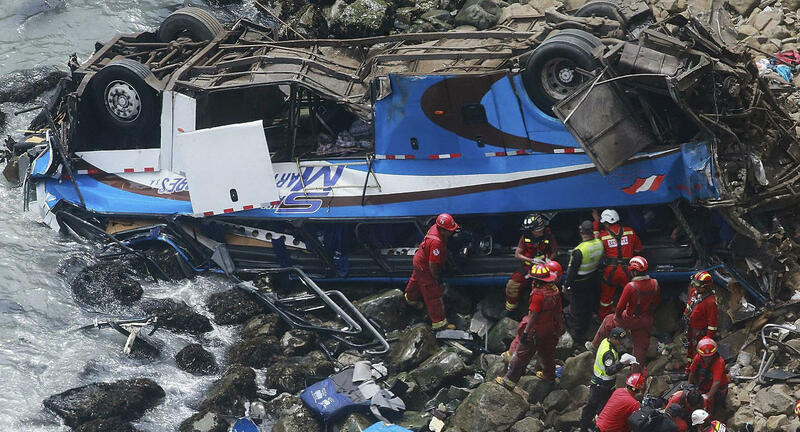 LIMA, Peru -- At least 30 people were killed when a bus tumbled down a cliff onto a rocky beach Tuesday along a narrow stretch of highway known as the "Devil's Curve," Peruvian police and fire officials said. The bus was carrying 57 passengers to Peru's capital when it was struck by a tractor-trailer shortly before noon and plunged down the slope, said Claudia Espinoza with Peru's voluntary firefighter brigade. The blue bus came to rest upside down on a narrow strip of shore next to the Pacific, the lifeless bodies of passengers strewn among the rocks. "There is a large number of fatal victims," Col. Dino Escudero told RPP radio. "It's a dangerous curve zone." Rescuers were working to pull victims from the hard-to-reach area in Pasamayo, about 70 kilometers, about 43 miles, north of Lima. No road leads directly to the beach, complicating rescue efforts, Espinoza said. Police and firefighters managed to transport five survivors with serious injuries to a nearby hospital. Traffic accidents are common along Peru's roadways, with more than 2,600 people killed in 2016. More than three dozen died when three buses and a truck collided in 2015 on the main coastal highway. Twenty people were killed in November when a bus plunged off a bridge into a river in the southern Andes. Espinoza said the passengers in Tuesday's crash included many who were returning to Lima after celebrating the New Year's holiday with family outside the city. The stretch of highway is known as the "Devil's Curve" because it is narrow, frequently shrouded in mist, and curves along a cliff that has seen numerous accidents.